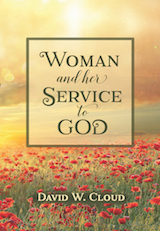 The following is from Woman and Her Service for God, a new course published by Way of Life Literature. Mary is named “Magdalene” because she was from the town of Magdala on the western shore of the Sea of Galilee north of Tiberius. - It is also called Migdal or Migdalel (Jos. 19:38). The peaceful little town was beautifully situated on the lake. A short distance to the west is the eastern slope of Mt. Arbel. - Magdala had a nice fishing harbor, and the ancient sardine industry was centered there. The Greek name of the town, “Tarichaea,” means “place where fish are salted.” The Greek word used in John 6:9 for fish is opsarion, which is a different word from the one normally used for fish in the New Testament (ichthus). Opsarion refers to salted fish used as a relish with bread. - Recent archaeological work found a large synagogue dating to the first century. Christ would have preached here (Mt. 4:23). The synagogue had mosaic floors, and one of the surviving mosaic images depicts a Galilee fishing boat with a sail and three oars. Also found in the synagogue was a carved stone inscribed with the image of the menorah from Herod’s Temple. Since this is a first century synagogue, some of the priests who attended would have seen the actual menorahs in the Temple. - In 1986, a first century fishing boat was discovered under the mud in the ancient harbor at Magdala. It was 27 feet long by 7.5 feet wide, had a mast and sail and two large oars, and could accommodate 14 or 15 people. This was probably the typical fishing boat of Jesus’ day. It is housed in the Yigal Allon Museum in Kibbutz Ginosar. We don’t know anything about Mary’s marital status, except that a husband is never mentioned. Mary had been demon possessed and afflicted with sickness, and Jesus cast seven devils out of her (Lu. 8:2). Mary became a fervent disciple of Christ and was one of the women who ministered to Jesus and the disciples during His ministry in the region of Galilee (Lu. 8:1-3). The Bible emphasizes the prominence of women in helping Christ during His earthly ministry. Mary stayed at the cross and witnessed Jesus’ death (Mt. 27:55-56). All of the male disciples fled, it appears, except for John. But many female disciples from Galilee remained with Christ in His suffering, including Mary of Magdalene. Mary visited Christ’s tomb after His death and observed the preparation of His body and its placement in the tomb (Mt. 27:58-61). The “other Mary” was the wife of Cleophas and the mother of James and Joses. - Their great love for Christ would not allow them to abandon Him even in His death. They sat and watched and planned to return after the sabbath to anoint Him with sweet spices (Lu. 23:55-56; Mr. 16:1). “Carefully watching where they laid the Lord’s body, that they might not leave off their kindness to him living or dead, as she said of Boaz, Ru. 2:20. Heavy they were as heart could hold: yet not hindered thereby from doing their duty to Christ. So Daniel, though sick, yet did the king's business. Even sorrow for sin, if it so exceed as to disable us for duty, is a sinful sorrow, and must be sorrowed for” (John Trapp). It was to Mary, a woman, that Jesus first appeared that morning (Mark 16:9). John 20 describes the scene in more detail. She saw the stone rolled away and ran and told Peter and John (Joh. 20:1-2). She returned after they left and was weeping at the tomb when she saw Jesus and thought he was a gardener, and He revealed Himself to her in such a touching and intimate manner. “Then the disciples went away again unto their own home. But Mary stood without at the sepulchre weeping: and as she wept, she stooped down, and looked into the sepulchre, And seeth two angels in white sitting, the one at the head, and the other at the feet, where the body of Jesus had lain. And they say unto her, Woman, why weepest thou? She saith unto them, Because they have taken away my Lord, and I know not where they have laid him. And when she had thus said, she turned herself back, and saw Jesus standing, and knew not that it was Jesus. Jesus saith unto her, Woman, why weepest thou? whom seekest thou? She, supposing him to be the gardener, saith unto him, Sir, if thou have borne him hence, tell me where thou hast laid him, and I will take him away. Jesus saith unto her, Mary. She turned herself, and saith unto him, Rabboni; which is to say, Master” (Joh. 20:10-16). Jesus simply said, “Mary,” and she immediately knew who He was. “She did not know this supposed gardener who talked to her was the Lord Himself. Then this seeming gardener said just one word: ‘Mary.’ O the music of it. And mark how she answered: ‘Rabboni; which is to say, Master.’ All He put into that word, ‘Mary,’ she put back into that word, ‘Master.’ All the love that said, ‘Mary,’ from His lips, from her lips replied in ‘Master.’ But she said more than just ‘Master.’ ‘Rabboni’ is a noun, in the possessive it means: ‘My Master.’ Just as David said, ‘My shepherd.’ With that same intense accent of personal appropriation she said, ‘My Master.’ In that supreme moment she forgot everybody, everything else but Him and herself” (I.M. Haldeman).